Introducing to the market innovative and advanced technology full range of orthopedic products. 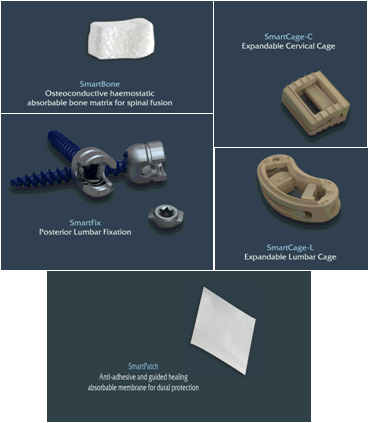 SmArtSpine was founded in July 2007 as the brainchild of a spinal surgeon and three industrial entrepreneurs to exclusively develop innovative spinal products. Our products are engineered to simplify spine surgery by providing superior and highly ergonomic designs. To perfect its design, SmArtSpine operates its own instrument prototyping shop and uses state of the Art CAD/CAM Software. Furthermore, SmArtSpine has established industrial partnership with local Instruments manufacturers to seamlessly bridge production and prototyping. TRB Chemedica is a Swiss pharmaceutical company, with a focus on research, development and marketing of innovative niche products in specific therapeutic areas, including rheumatology, ophthalmology and neurology. TRB Chemedica markets a range of ethical pharmaceuticals and medical devices, most of which are patented, in more than 40 countries worldwide. Traditional, innovative, quality orientated - SPORTO-MED is specialized in the areas of physiotherapy, sport medicine and health. SPORTO-MED, develops and produces particularly high-quality preparations and medical products. SPORTO-MED motto is "healthy physiotherapy“. Supreme quality, a high level of practical use and optimum effectiveness are some of the distinctive features of the unique profile which SPORTO-MED products enjoy on the market. SPORTO-MED have high production standards, execute extensive product tests and prophylactic investigations and are also quick to implement the new knowledge we acquire.